The dobro's telling its own story to me. All aspects of this image are perfect Evert. Will call it a professional post, lol! PS: I'm very curious for the fourth one in this series to come. Hi Cornelius, a reaction 5 minutes after my upload. By the way, the fourth is called Saxophone. Nice to hear that you "know your guitars (lol). After completing this Blues Collection serie I will upload some of my “free” work (no assignment) and I hope I will surprise many viewers although I think I will get a lot of discussion (lol). Thank you Cornelius for your “faster then the speed of light”-reaction. The dobro reminds me of the Grand Ole Opry. It's sound is unique. and I feel you have to have a love for country blues music in order to really appreciate it. It appears that the musician has had a glass of beer (just my interpretation) and is probably not hooked on the real hard stuff. 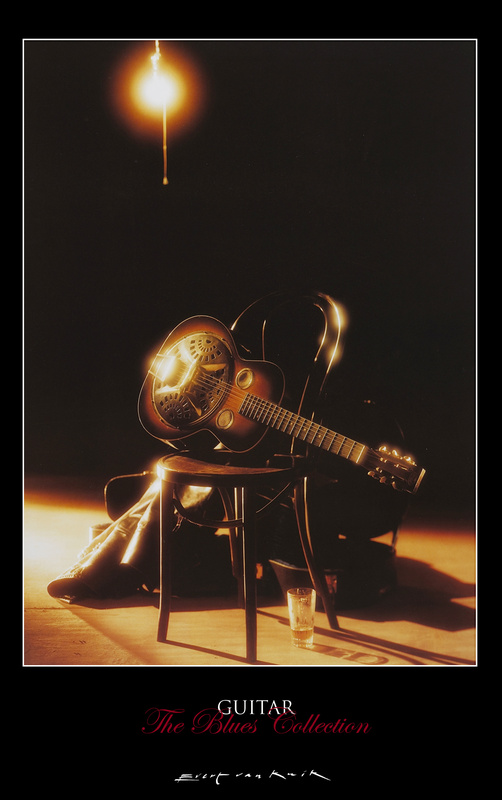 He is definitely coming back to do some more playing, because he has left the dobro sitting on the chair and the light is still on. I wouldn't mind sitting in the room listening to him. Excellent addition to the Blues Collection. I am really enjoying this series. Nice to receive so many compliments and all the credits for some photographs I almost took 15 years ago. The “problem” with more up-to-date pictures is that 99% of all my work is client-related and I have to get permission from the related client to publish them on the internet. I hope you all understand. Because the fact of Verkerke Posters, who published the pictures I uploaded, got bankrupt some years ago it is possible to show the work I made for them. The Buick Park Avenue pictures was, because this picture is also shoot more than 10 years ago also no problem. But, next to my last update of The Blues Collection (Saxophone) I will upload more recent and “free” work. Thank you guys for all your interest in my photo’s and myself. Hello Evert...Still-life photography demands a great deal of care and imagination and as you know the rewards for a good still-life photographer can be enormous...Your approach to still-life photography is quite outstanding and this can be seen in this beautiful still life picture.....You must spend hours if not days arranging and rearranging the set up until you get it perfect.....Well done.....All the best to you Evert..............................................Mick. Keb Mo leaps to mind. I'm only a couple of shots into examining your gallery and I'm already a big fan of your light. Are your hot spots darkroom burned in or live light? To me, what's seen in shadow and the mood of shadow are the most emotionally moving parts of any painting or photo. Love the added touch of the old light above.